This finger labyrinth was a Christmas gift to myself, and I use it more than I thought I would. Although it's designed to use a finger to work through the labyrinth, I often use a pachinko ball that was a souvenir from my time in Japan. The ball is the perfect size for the pathway. 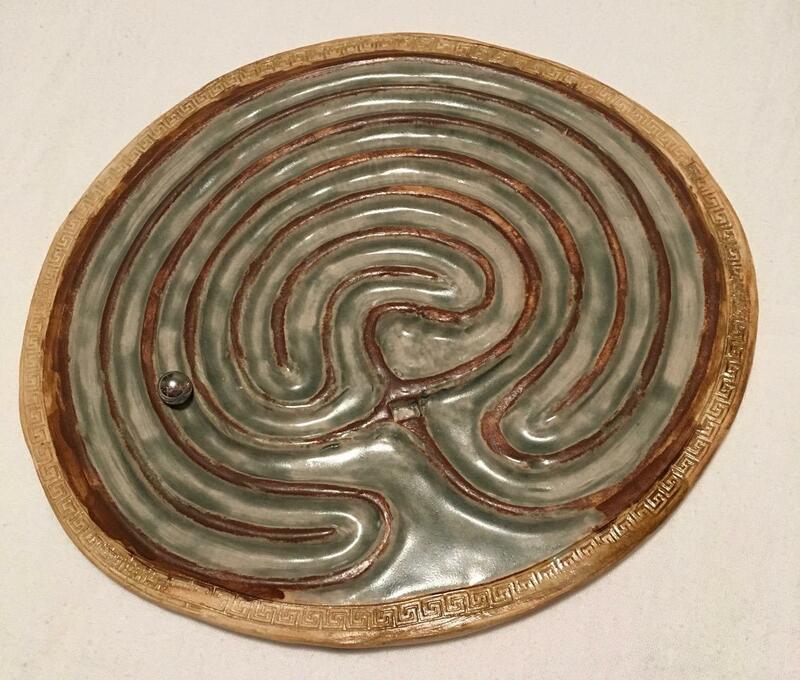 Often, I use the labyrinth right before going to bed: it helps to clear my mind and slows my breathing. Even though it's been months since I've knit a pair of socks, I've discovered it's like riding a bike: it's a skill that the body remembers without too much effort. The last pair(s) of socks I knit were completed in July. Yikes, that's SEVEN months without knitting a pair of socks! I just finished the sixth row of the gusset, so I will soon be cruising through the foot section. 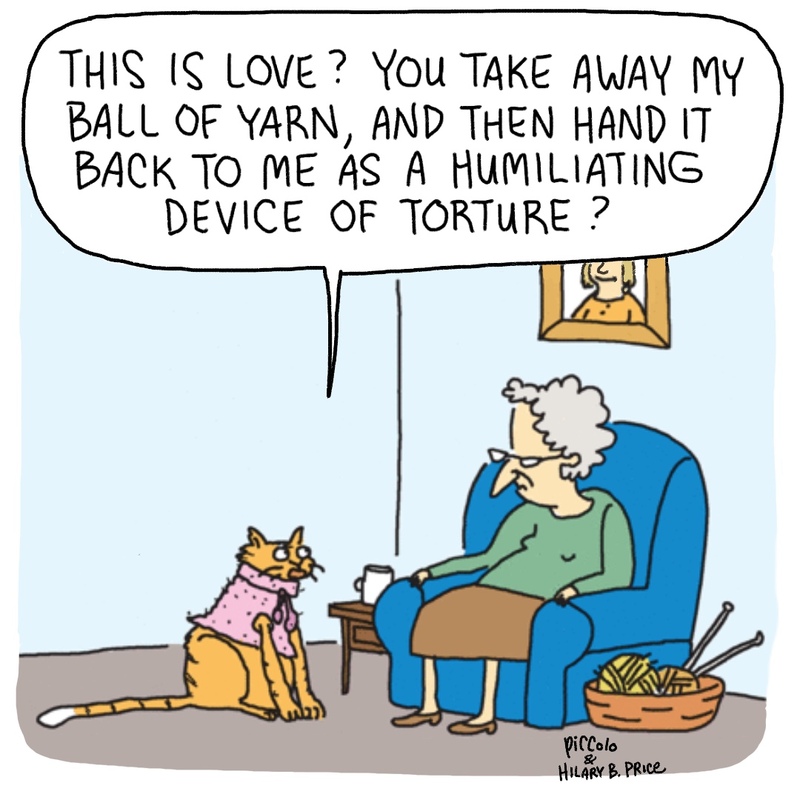 Knitting notes can be found here. The Sockhead Cowl came off the needles on Saturday. 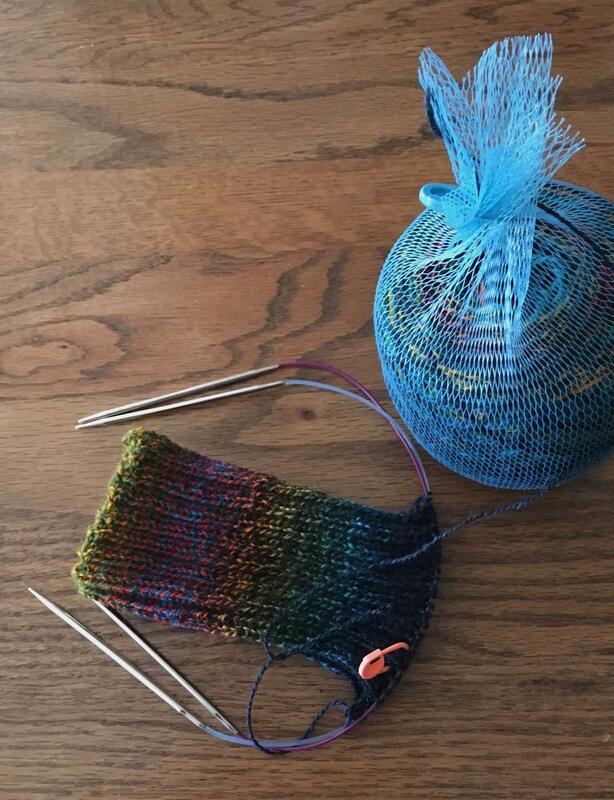 I probably could have knit another row or two, but as the yarn ball got smaller and smaller, I didn't feel like playing "yarn chicken." I plan to knit one or two more of the cowls out of some solid, stash yarn. I think they would be perfect to donate to the homeless shelter. 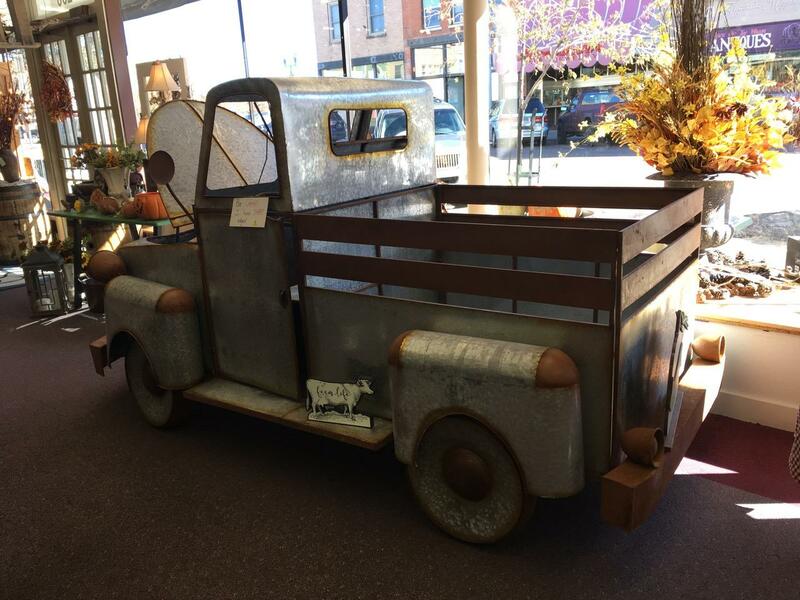 The cowls would be nice for men or women and will cut the Wyoming wind nicely. 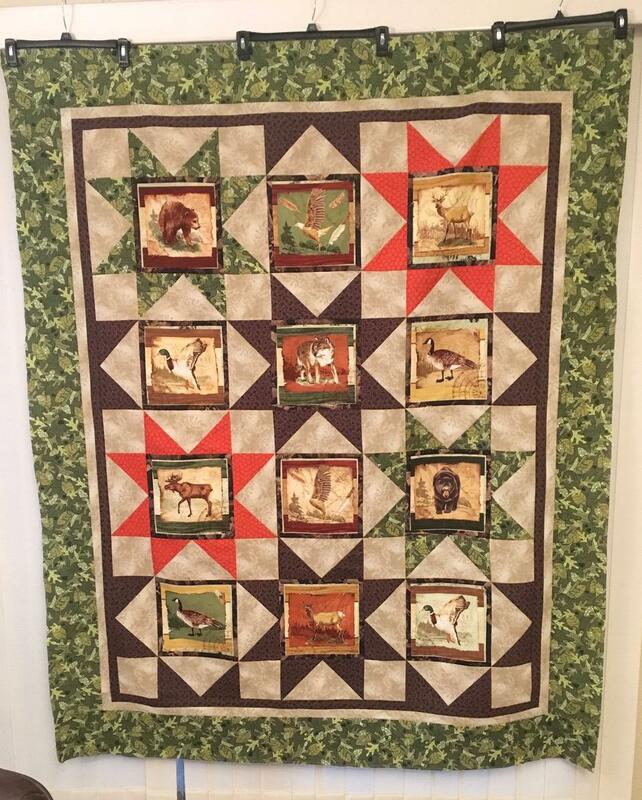 Early February, I sent three Quilts of Valor to Cheryl B., a volunteer longarm quilter in Elk Mountain, WY. She packaged the finished quilts and sent them back to me on February 12. 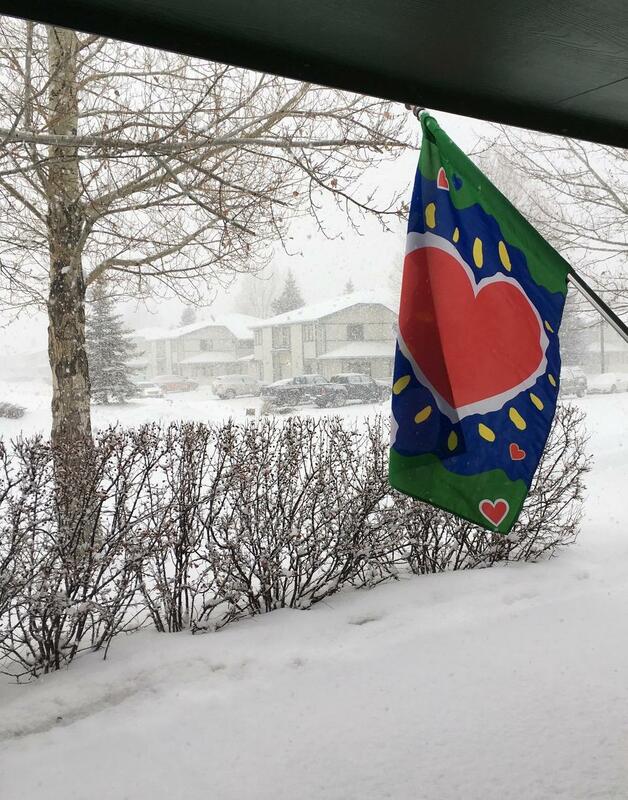 A winter storm hit the area and high winds and accidents closed sections of Interstate 80 for a couple of days. It was at that point that the whereabouts of the packages was unknown: the most information I could get was that the packages were "In Transit." (I later learned that the "In Transit" notification is sent automatically by a computer after a specified period of time.) 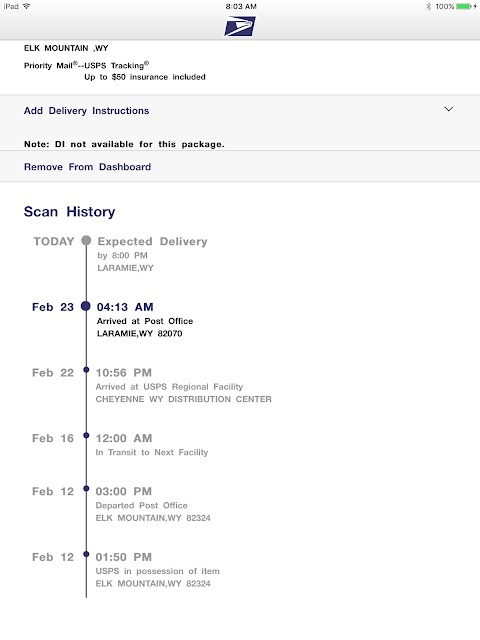 I knew there was a problem because typically the notifications give the site where the package was scanned. 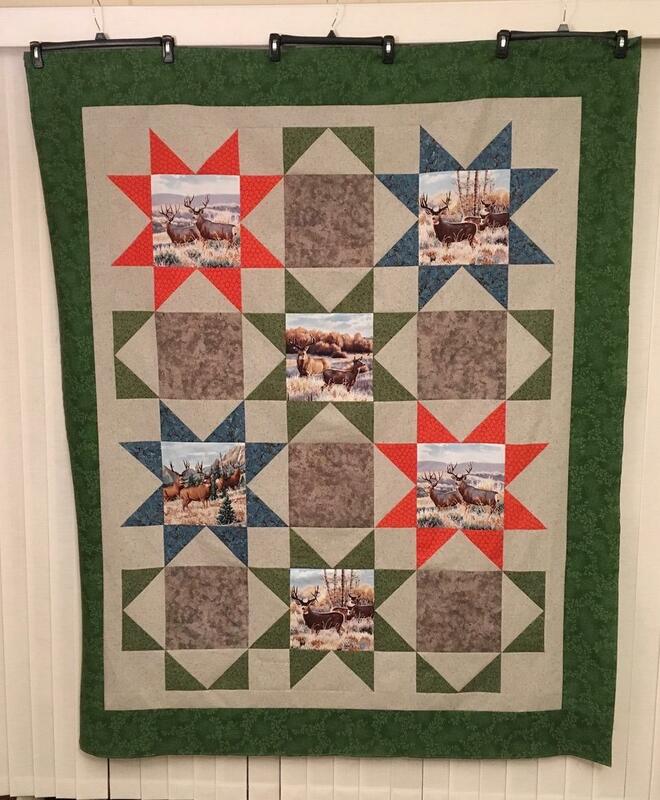 Elk Mountain is about 61 miles from Laramie, so I wasn't too worried that the quilts would be permanently lost. 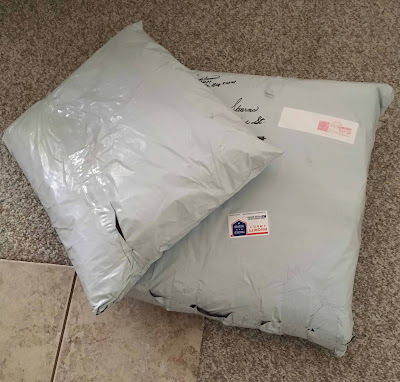 After a week of no specific information via the tracking number, I went to the post office and asked the clerk if she was able to give me some idea where the packages were. She could not get any additional information, and filed a trace. When I got home, I also completed an online form about the missing packages, as did Cheryl. 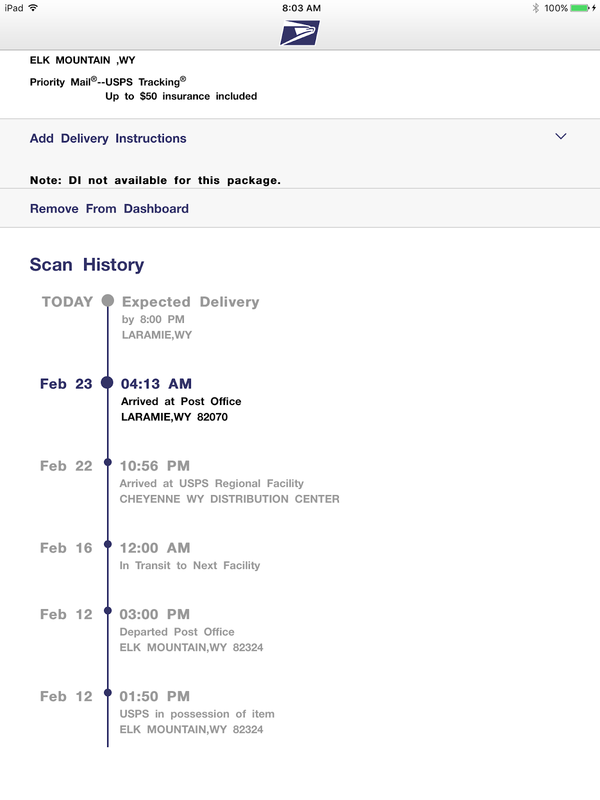 Four days later, I received text and email notifications that the packages would be delivered with my mail. Saturday afternoon, the three Quilts of Valor were delivered to my front door - the lost was found, and I was relieved and thrilled. These well-travelled quilts will be trimmed, labeled, and bound and then sent to Montana for distribution. 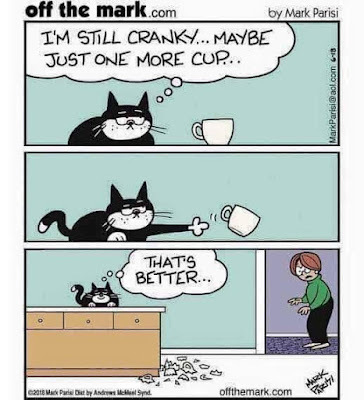 I hope they don't get sidetracked again. 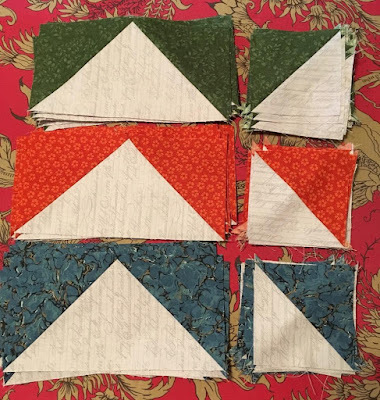 . .
A major benefit of using the same pattern to make the last three Quilts of Valor was the resulting 186 bonus HSTs (half-square triangles) - 62 from each quilt. You may have noticed that the quilts used the same fabrics - or colors - for the flying geese used for the star points: that decision was deliberate. 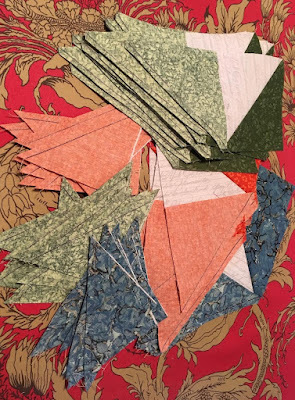 Since the flying geese were large 5 x 9.5 inches, the "bonus" HSTs were larger than usual. To save time, I sewed an extra seam on the units and then . 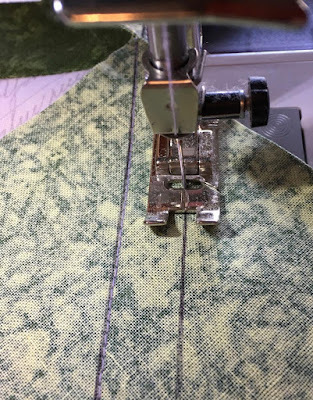 . .
cut between the two seam lines. 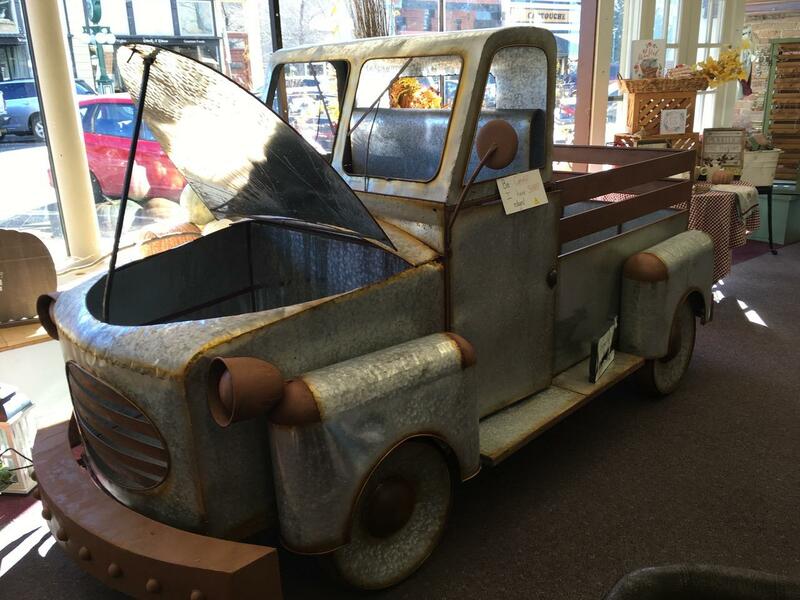 Once the units were cut apart, they were pressed. Each quilt required 31 flying geese units, and their corners created 62 bonus HSTs. 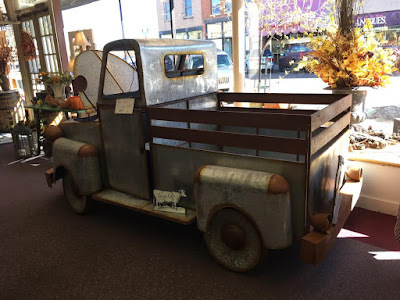 It's hard for me to imagine that some people throw these corners away when they are cut off of the flying geese. 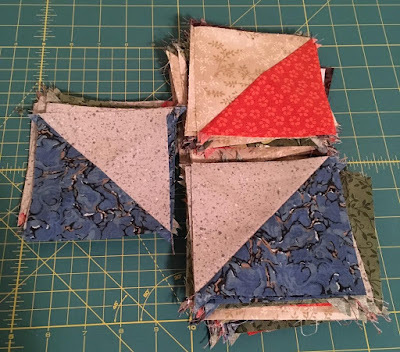 I'm not sure how I will use the 186 bonus HSTs, but they could become pinwheels, star points, flying geese, or a several other options. Vera recently finished the Sockhead Cowl, and from her photos, I knew I had to knit the pattern. 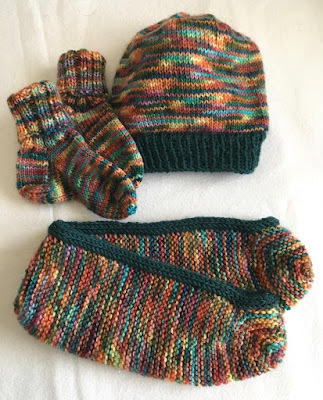 It's an easy project and is excellent for TV knitting. 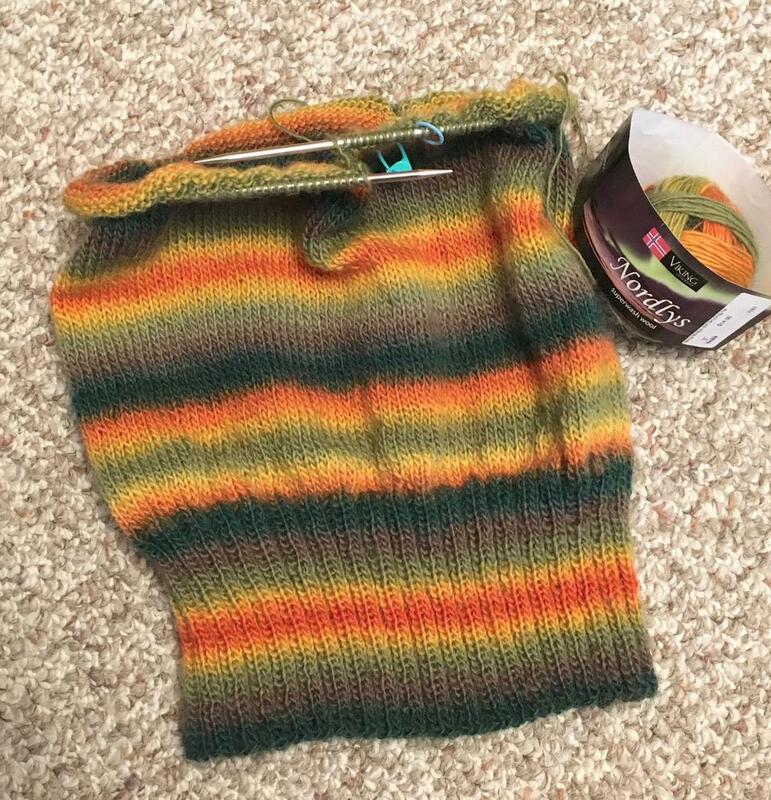 My cowl is going to be shorter than the pattern, but I used a larger needle. 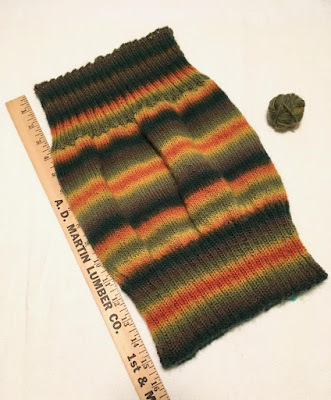 It is presently 12 inches long, and I've just started the top ribbing: the finished cowl will be approximately 16 inches long. It has been months since I knit a pair of socks (other than the baby socks I knit for the shower), and I've honestly missed it. Note: The blue netting I'm using as a yarn sock was cut from an old bath puff. It's secured with a knot on one end, and a removable stitch marker on the top. 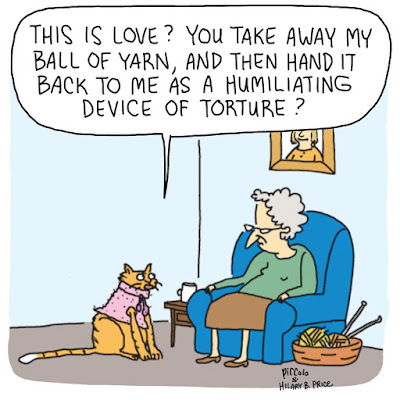 It keeps the yarn corralled and clean. 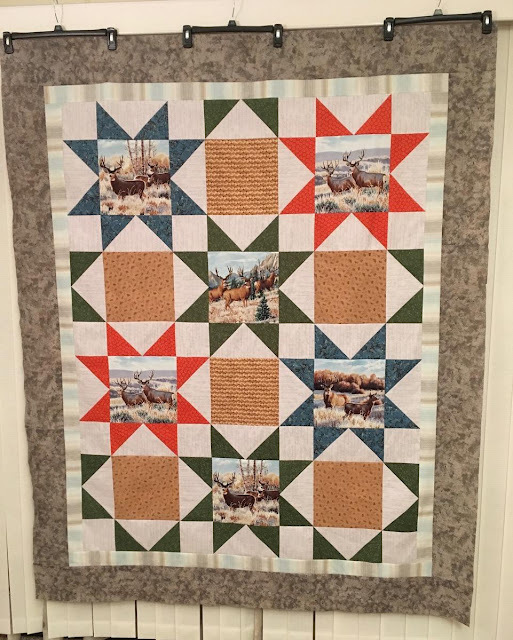 one block for Oh, Deer! 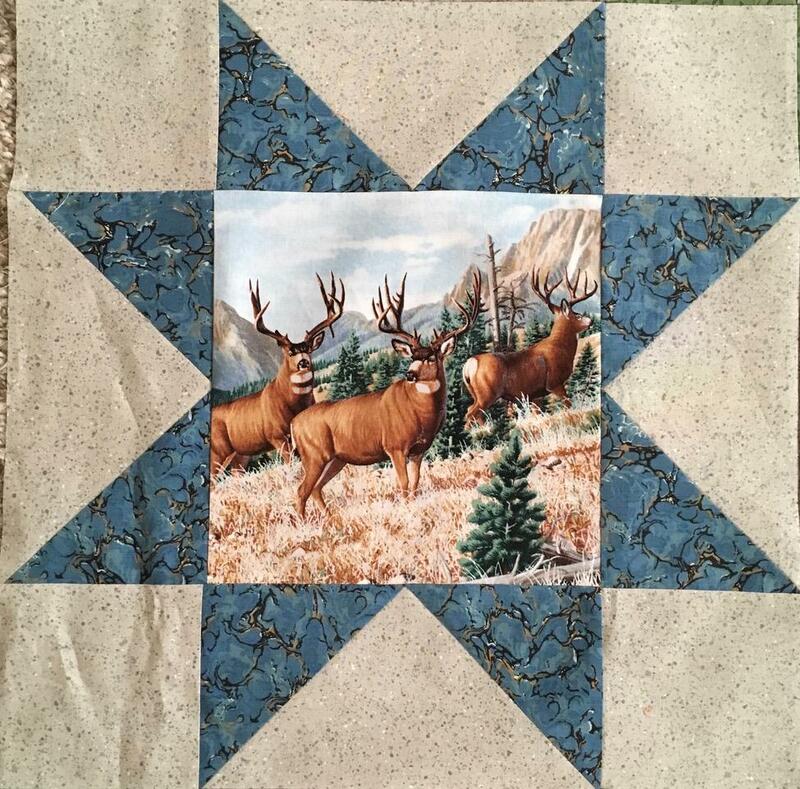 Work on the next Quilt of Valor (Oh, Deer!) 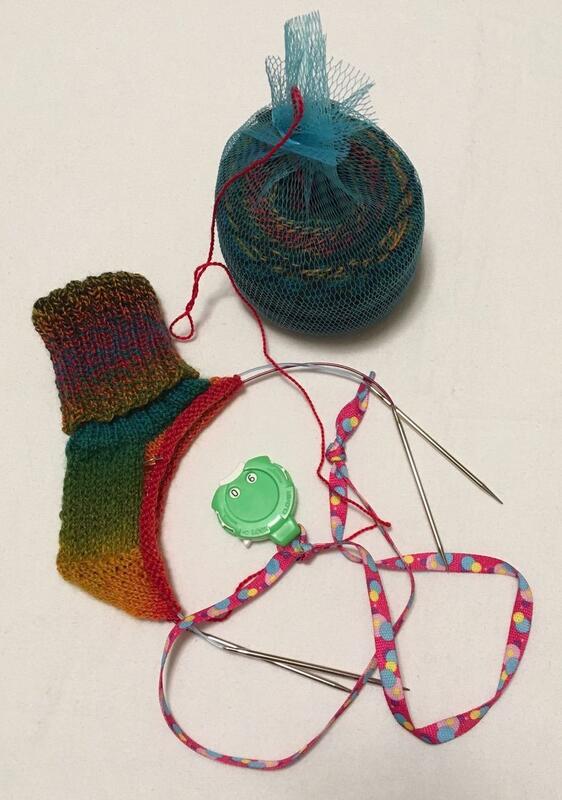 has been stalled by life -- appointments, commitments, knitting night, and even a baby shower. 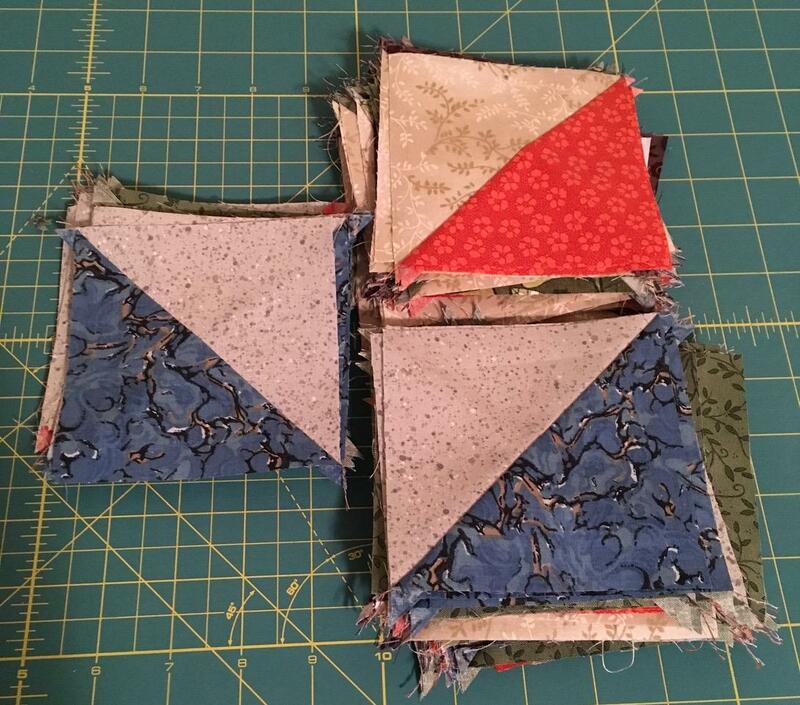 The star blocks are finished, but they have not been sewn into a flimsy. Many of you might remember the post about my great-niece's special request for knit slippers/footies. Since the baby shower is this Saturday, I thought I would surprise her with some items for the baby (he's due in March). 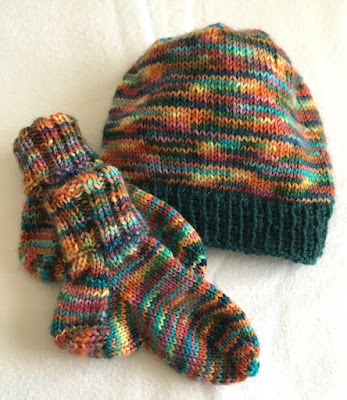 It was fun to knit the tiny socks and then make a matching hat. I hope Stephanie will share a photo of both of them wearing their footwear/hat. 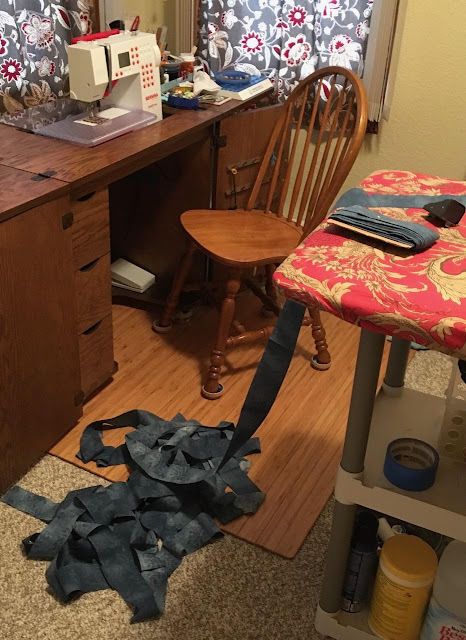 Saturday, I tackled the mess in my sewing room because it was impossible to get anything done. The cutting table was covered with numerous bins, piles of scraps, and stacks of books. 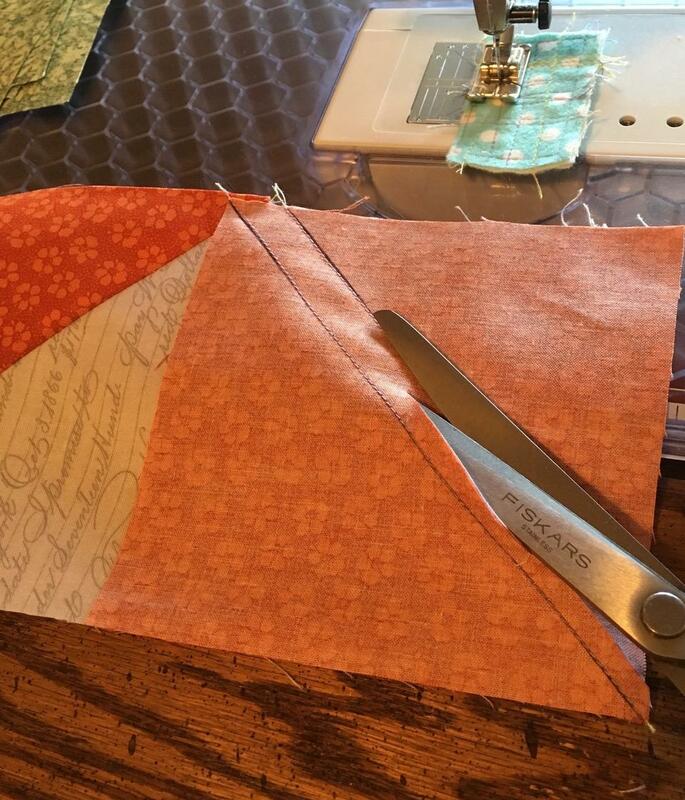 Once the fabric was sorted and returned to the shelves in the closet, I began with the scraps. Small pieces were cut into sizes I use and placed neatly in bins. Larger scraps were cut into 2.5 inch strips for future bindings. 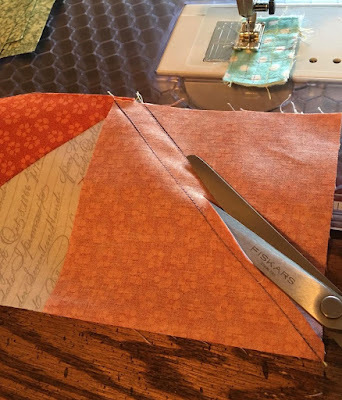 I often use the backing scraps to bind quilts. One nice thing about using the same backing fabric for several quilts is a LOT of strips for binding. The blue fabric strips in the photo will provide binding for at least two quilts. I press the strips in half and roll them on cardboard, so they are ready to attach when I receive quilts back from the longarmer. The cutting table and pressing board are clutter-free, the fabric is all stored away, and I've started a new project. 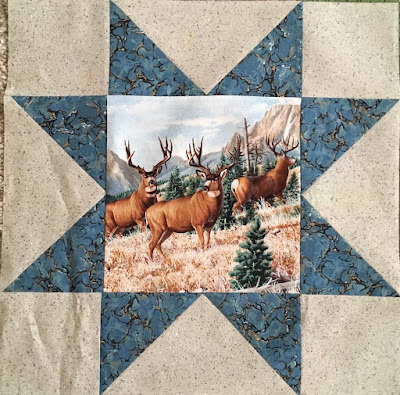 American Wildlife was made with a free online pattern called Bear Sees Colors by Deborah G. Stanley. Homophones were often confusing for my Language Arts (English) students. 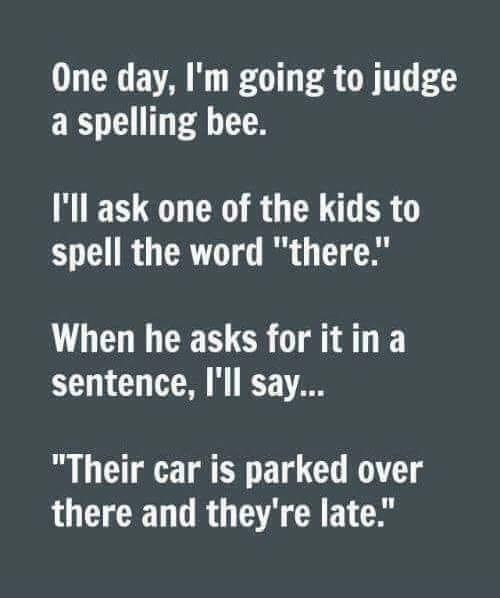 Can you think of any homophones (words that sound alike but are spelled differently) i.e., two, to, too; beat, beet; there, their, they're. Think about it a bit . . . before checking this helpful list.